Theodosius II was born in 401 AD the son of Arcadius and Eudoxia. 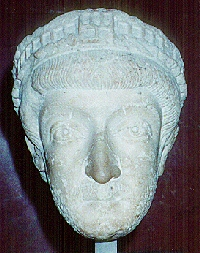 At the time of his father’s death, Theodosius II was only 7 years old. At first, the regency was held by the Praetorian Prefect Anthemius who was replaced in 414 AD by the Emperor’s sister Aelia Pulcheria who continued to be the defacto ruler of the Eastern Empire. Pulcheria even hand-picked the wife for her brother – Aelia Eudocia. Theodosius II’s reign was the longest in Roman history, and perhaps because Theodosius himself did virtually nothing on his own, was notably successful. His advisors were almost uniformly good, and for most of his life he was dominated by his extremely capable, albeit somewhat fanatically religious, sister Pulcheria, who precluded him from making any real mistakes. In fact, one of the hallmarks of the Theodosian Dynasty was the great ability of its female members, especially when compared to the notable incompetence displayed by Honorius and Valentinian III. Among the lasting legacies of Theodosius II’s reign were the stable governmental foundations it set up for the Byzantine state to come, the Theodosian Code of Laws, and the great land walls which kept out all enemies until they were breached by the Turks in 1453 (the Crusaders took the city from the harbor side). During the later part of his reign, the Balkan Peninsula was repeatedly ravaged by the Huns. Theodosius II entered into a treaty with Attila the Hun. The terms were very humiliating and demanded a tribute be paid to the Huns. This would continue through his remaining reign. Theodosius II finally died in Constantinople during July, 450 AD after being injured in a hunting accident.